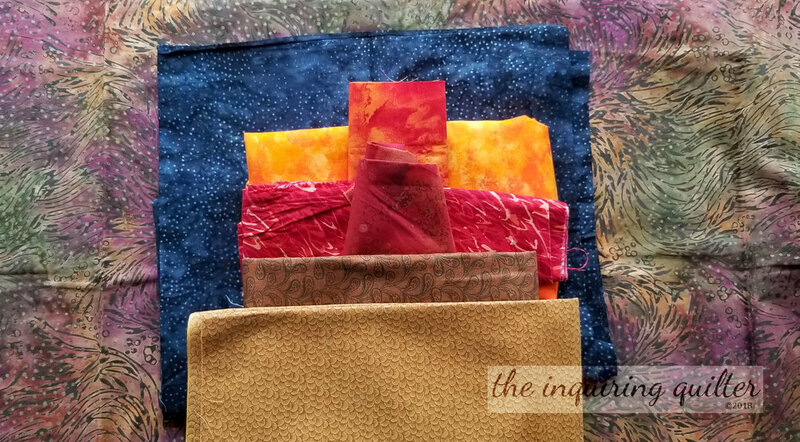 Welcome to Block 3 of the Fall Into a QAL, a mystery quilt along by Partners in Design. If you'd like to quilt along with us, it's not too late! Click here to learn more. The third block in our quilt along was designed by Sherry @ Powered by Quilting and it’s a bonfire. I don't know about you, but I love a bonfire in the fall! Roasting marshmallows for s'mores and occasionally catching them on fire <grin>, snuggling close to my darling husband (while struggling to stay out of the smoke of the fire <wink>), singing campfire songs, sharing scary stories, and staring into the flames are some of my favorite memories of bonfires. Here’s my version of the block. This block uses flip corners to make the flying geese, and raw edge applique to create the bonfire. If you’ve never used any of these techniques before--no worries! As a quilt along host, I’m here to help. As before, I had some goals for this block. When I first looked at the block, I thought of my memories of bonfires and wanted to capture them. 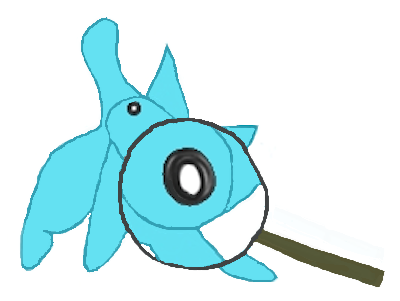 For that I'd need a starry nighttime background. I found this fabric and thought it was perfect. Second, I have a focus fabric that I want to use throughout my quilt, so my block fabrics needed to compliment it as well. In addition, I had a goal of using some of my focus fabric in every block if possible, but I just didn't think it worked for this block. I found another fabric that had a smaller print and most of the same colors, so I used it instead. Doesn't the second fabric (shown at the bottom here) compliment the focus fabric (shown here on top) well? Third, I wanted the flames to look semi-realistic so in my mind that meant yellow to orange to red fabrics. Here's Sherry's block from the pattern. For my fabric pull I started with my secondary focus fabric and my night sky fabrics. Next, I started pulling reds, oranges, and yellows I thought would make good flames. Finally I pulled fabrics for the logs. This turned out to be harder as my secondary focus fabric had brown in it and I needed to compliment that. When I had gathered a stack of candidates, I brought out my focus fabric so I could ensure my block fabrics would compliment it. As usual I laid the fabrics I was considering as they would be used in the block and made my final decisions. I love it when a designer includes pressing directions in her block pattern! So my first tip is...follow them and your block will go together much more easily. The pattern uses flip corners to make the flying geese. For this technique, you simply draw a diagonal on the back of your sky fabric (the 2-1/2" squares), lay one of the squares on the corner of your goose fabric (the 2-1/2" x 4-1/2" rectangles) right sides together and sew on the line. My tip is, sew a tiny bit inside the line (sew closer to the corner by a few threads) so when you press the corner back it completely covers the background. Then trim the goose to size. If you want you can use the no-waste flying geese method to make your geese. This method makes four flying geese at a time. I just used this method to make a bazillion flying geese for a secret sewing project so I thought I'd have better luck if I simply stuck to that method. Here's a link to my tutorial on the no-waste method if you want to try it. Cut your background square 9” as instructed. Finishing your applique may shrink up the background a bit, so having a larger than needed background square allows you to trim it to the final size (in this case, 8-1/2") after you've stitched down the edges of your applique shapes. 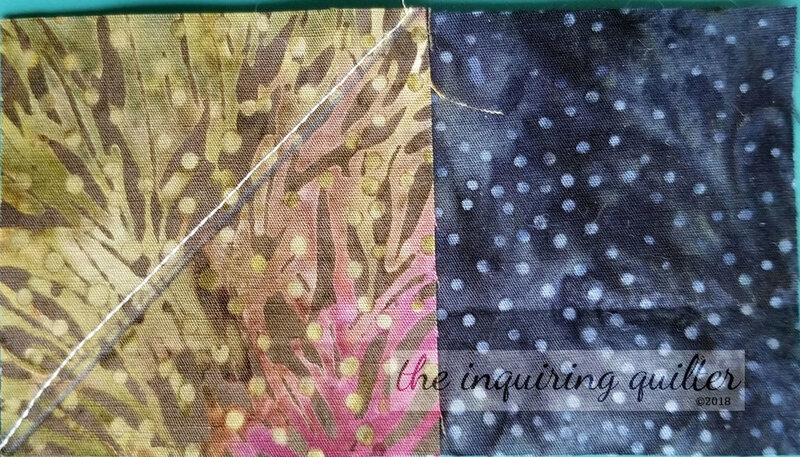 As you know by now, I use the Crafted Applique method for my fusible applique. This method fuses the edges of your applique shapes so they won't fray. Using this method you don't even need to stitch the edges of each shape although I do anyway. I described the Crafted Applique method in more detail in my tips for Block 1 of this quilt along if you want to read more about it. 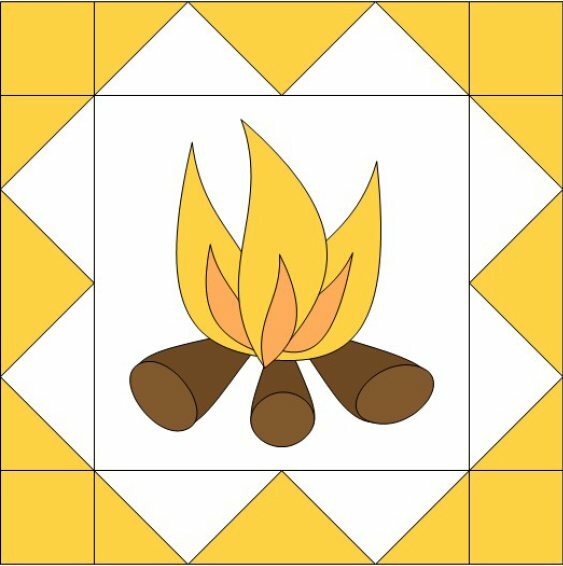 To build the bonfire applique, I started by fusing the pieces of each shape together using a Teflon pressing sheet so they wouldn't stick to it. If you don't have one you can use parchment paper. Using the pattern as my guide, I then fused the shapes (the flames and the logs) together into a single unit. Next, I pressed the background square into quarters, and used the pressing lines to help me center the bonfire and fuse it in place. Stitch around the edges of your bonfire to finish them and prevent them from raveling. Although you don't need to do that with the Crafted Applique method, I still do it anyway. For my block, I used Aurifil 50 wt. #2145 (Yellow Orange), #2255 (Dark Red Orange), and #2395 (Pumpkin Spice); Sulky 40 wt. #561 (Lipstick), Wonderfil Invisifil #719 (Copper), and Robinson Anton 40 wt. #1003 Gold to finish the edges of my applique. After appliqueing the bonfire in place, I lightly pressed the background and then trimmed it to 8-1/2” square. To add the flying geese border, I laid out my pieces then sewed the block together in rows. After pressing I trimmed my block to 12-1/2" square. If you have any questions while making this block, feel free to post them here in the comments. Just be sure to enter an email address when prompted so I can get back to you quickly. Here are my three quilt blocks. I think this quilt is really coming together! Where do i get the block pattern? 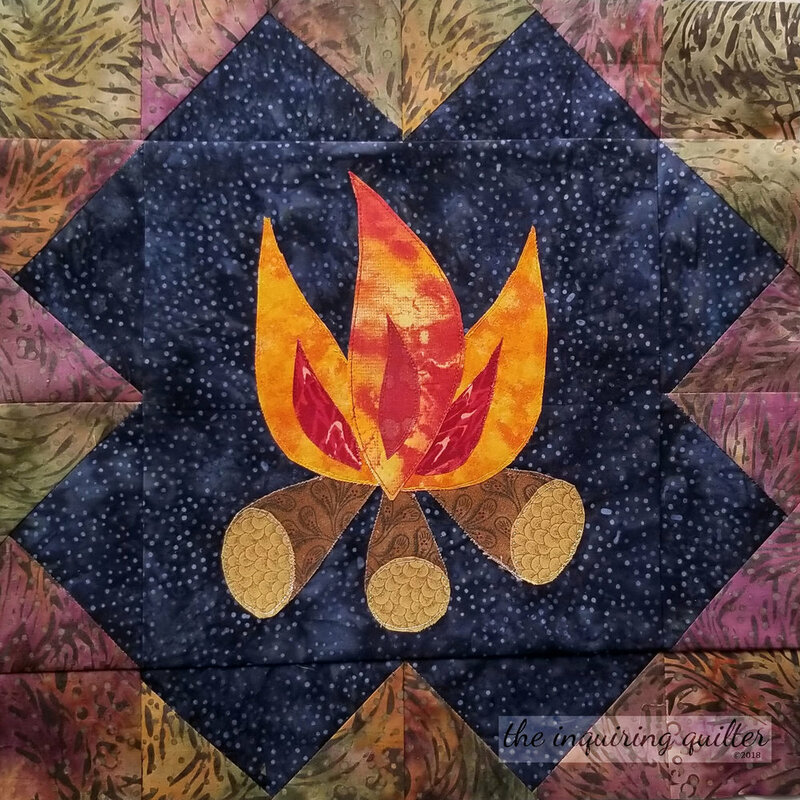 Drop by Sherry's blog to download your free bonfire block pattern. If you want to see the schedule for the quilt along and the list of block designers, click here. How Do I Enter the Giveaway? First, you must be 18 years old to enter. Then, to enter the Bonfire block giveaway simply make the block and post it in one of these three places before the deadline. You have until Monday, June 25th at 11:59 pm EST to post your block for a chance to win this awesome prize package—a free pattern of your choice from Powered by Quilting, Seam-Fix TM Double-Sided Seam Ripper, and Omnigrid 4-1/2" square ruler. On Tuesday, June 26th be sure to come back here for the next block in our quilt along! 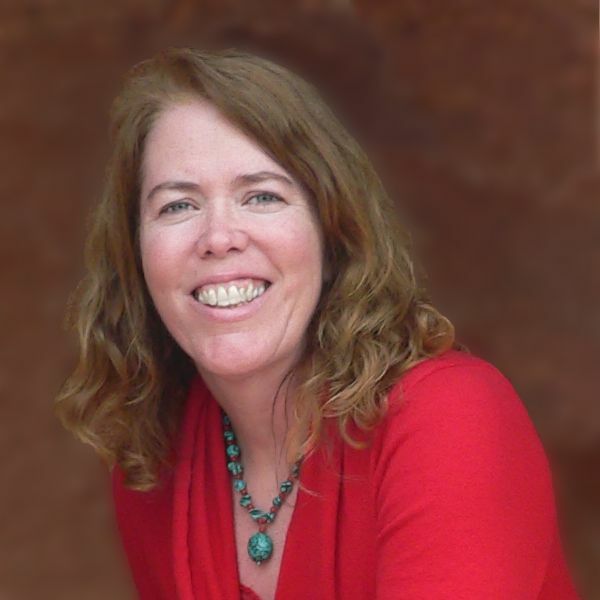 You can follow me on social media or sign up for my newsletter if you’d like a reminder when the next block is posted. You’ll find all the ways to follow me at the top of my sidebar. 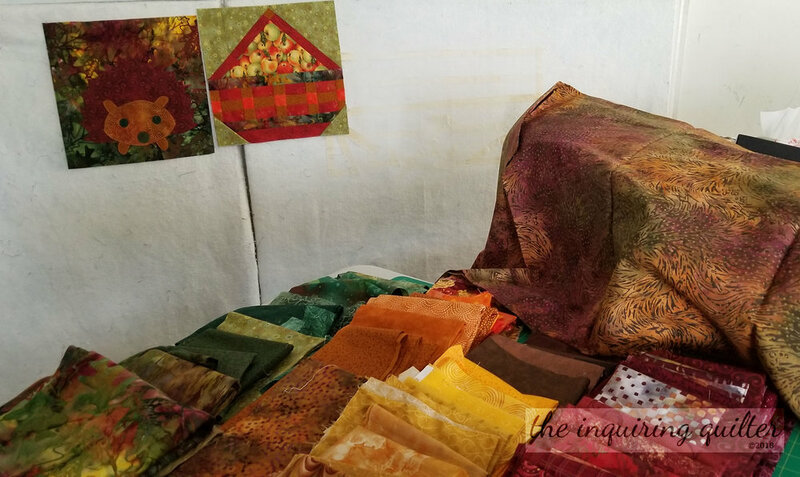 If you have any general questions about the quilt along or would like to see the complete schedule, click the Fall into a QAL tab above. The Final Grand prize package for our quilt along will be announced October 16th. Tell me...what do you like best about bonfires?